Fire Dress is based on Javad's acrylic painting. The model is wearing small. She is 180cm tall and size 8. 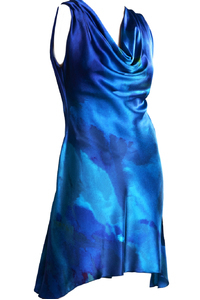 95% Silk Satin with 5% Spandex. Small: Size 6 - 8. Bust: 80cm - 85cm, Waist: 60cm - 68cm, Hip: 85cm - 90cm. Medium: Size 10 - 12. Bust: 88cm - 96cm, Waist: 70cm - 80cm, Hip: 94cm - 100cm. Large: Size 14 - 16. Bust: 98cm - 103cm, Waist: 80cm - 85cm, Hip: 104cm - 109cm.